The scent is drifting in through the open window, clinging to the breeze that whispers to me at 3:05am. Rainwater soaking into the woods, the leaves, seeping into the dirt. It’s a familiarity that comforts me, and this is what I need at the moment, not from another being but from nature, from something resembling a God or a Heaven. I believe in the healing of the rain more than I ever might in the other. The falling water seems to be a prelude to the tears that have yet to come. A few weeks ago, I found an old box of letters, and as each one was opened – each card smiled at once again, each friend remembered, it seemed as if I were once again drowning in the fountain of my youth. Letters from junior high – thirteen year old girls weighing in heavily on the deepest matters of the world, - “does he like me, do you think? Which song should I dedicate to him at lunch? ?” Notes that followed us into high school, where the boys numbered many and the matters were deeper still. A bundle of letters fell out, scattered on the table, and like an old home movie, a scratchy reel began to play out in the words before me. It was 1995, I was headlong into the radio station, working full-time hours for not a cent of pay. My motivation was strong, my following was steadily growing. Our station had signals that reached far into the hills and wide as far as Canada – listeners whom I heard from on occasion. I’d developed my show with my tongue firmly in cheek. When in the office, a business head prevailed. In the studio, caution was checked at the door, and for the first time that I could remember, I was having fun, and was finally being recognized for something. I enjoyed my listeners, most of them. There was something in me, from the time I was young, that connected to music. Growing older, being a child once upon a time of hidden wishes, I was driven to bring others and a favorite song together in a medley of emotion – be it happy, sad, angry… searching. Spinning vinyl apologues connected me to strangers in the universe, while I was heard but unseen. I was touched by his poetic words of my show being the bright spot in his otherwise dreary life, and how the songs being played were an anthem of his inner “good guy.” Every instinct in me sternly warned against any sort of contact in return, but I never was one to listen to anyone, including myself. Hesitantly, I wrote back. There had been several pen pals throughout my years, from many walks of life – seemed I was always finding new reasons to write to someone, but being answered in return meant something to me. Bryan and I became fast friends, exchanging our sad stories, empathizing without sympathy, understanding without judgment. He never blamed anyone but himself for the mess he was in. His crime log included assault, burglary, drugs. “Straight up, Kym, it was my punk self that got me here inside this cell, where the walls come in a little closer every day.” He wasn’t much older than I was. He was shuffled from prison to prison every year or so, and often he would end up somewhere that he couldn’t hear the show, but he had somehow procured a cassette deck for his cell. I would tape my shows and mail them with my letters, which were a journal of my anger and desperation at the time. In his letters, Bryan would describe his “homeboys,” where respect and loyalty were thicker than water, and often paid for in blood. His soft spots were two: his young daughter, and his best cellmate, “Deputy Dawg” Sean. He and Sean would collaborate and send me the most amazing graphic work. The letters would be written on hand-crafted stationary with flames, flowers and skulls in the corners. People often resent tag artists, for their graffiti and their attitudes, but truthfully it was a way for many street kids to shout out to a world who had abandoned them that they existed. Tattoos, street graffiti, and their creators are a representation of something enchantingly beautiful in their otherwise horrific lives. Bryan did his best to atone for his sins, with what humanity he had left. He would talk about reuniting with his daughter, about “going legit on the outside with Deputy Dawg – maybe auto mechanics, a body shop or something big like that.” He had a long way to dream, not scheduled for release until 2001. After writing faithfully back and forth for a few years, he bravely asked me if I would ever consider visiting him. I thought about it long and hard before agreeing to try. I filled out the application, but was denied due to outstanding warrants on traffic citations. Not having the money to clear them, the idea appeared to die somewhere in the miles between us. My grandmother and my brother were all up in arms when they discovered I was writing to (gasp!) a convict. My brother had pilfered a letter one day he’d seen in a stack of my mail, and promptly they ganged up to come down hard on me. Friends weren’t much better with their lack of acceptance in yet another of my “misguided” deeds. If only I could remember things I’d written to him, but the words are vanished from my mind like a leprechaun running off with his gold. Such a turbulent, fiery time of my life. Long nights spent at work, whisking off letters I wrote by hand describing the turmoil all around me – always the compassion he felt for me outweighed the pity he felt for himself. The sense of humor he kept as a defense shield, I got that – knowing it all too well. The positive outlook, I hadn’t a clue. I had freedoms he could only lie in a dingy, dim cell and long for, knowing they’d been stolen away by his own hand. And yet… he was the one always trying to make me smile. Bry-guy was not only my biggest fan, but my biggest supporter as well – be it with my microphone or my pen. Always encouraging me to pursue my chosen career, no matter where it led me. As I pondered a move to Minnesota, where I could keep an eye on my friend Jackie and her kids while diving into the shallow end of broadcasting, Bryan knew that his letters would reach me wherever I went. It was now 1998, and I was in a state of indecision, but saving my meager paychecks nonetheless. Bryan was never disappointed in me as I bounced around jobs, dates, friends. If somebody hurt me, he was there with a hug expressed in verse, and a threat of bodily harm following quickly after. “On average, I’m out of the cell maybe 2 hrs a day – the rest of the time I’m usually inside this concrete coffin. I’ve been here [at the new prison] for 3 months and still haven’t gotta job! He longed to meet face to face, but never pushed the issue, knowing it was a hardship, sensing also the slightest bit of fear. I would send a pittance of money whenever possible so that he might buy things he needed. Stamps, letters, pens – “we only get to go to store once a month – if you can’t don’t trip, honest!” It was never enough to assuage the guilt that simmered in my belly for not making that trip. I don’t recall when it was that my letters faded away. I think it was around the time I met my husband. He wasn’t especially fond of the idea of our friendship, and I conceded because there were bigger battles I felt to come. He meant well, with his protective nature, it was always myself I held accountable for letting yet another slip away as I moved into a new life. 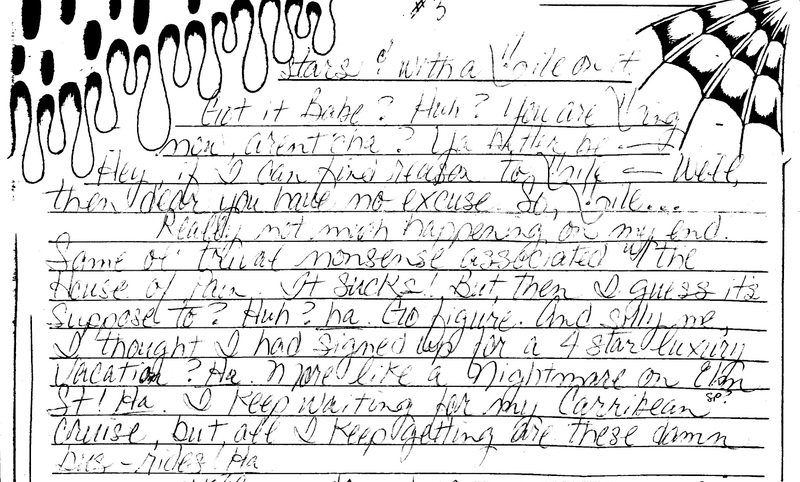 Roger was more understanding several years later in 2005 when I wanted to try writing to Bryan. 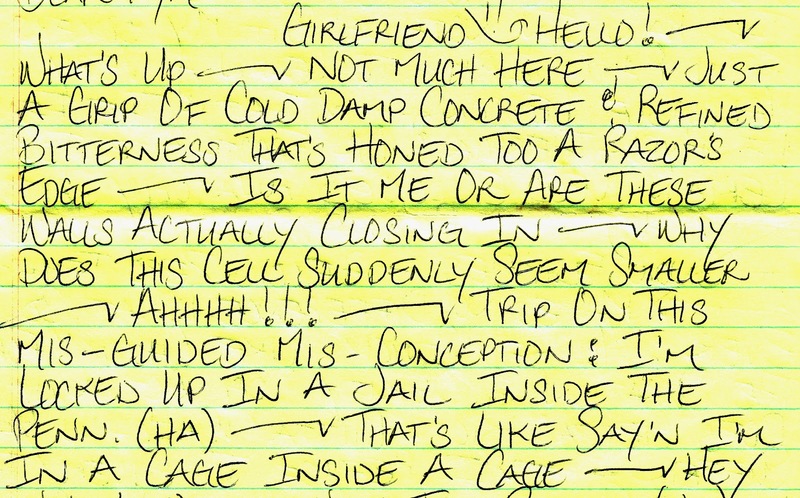 A letter was sent to his last known prison address, but a reply never came. 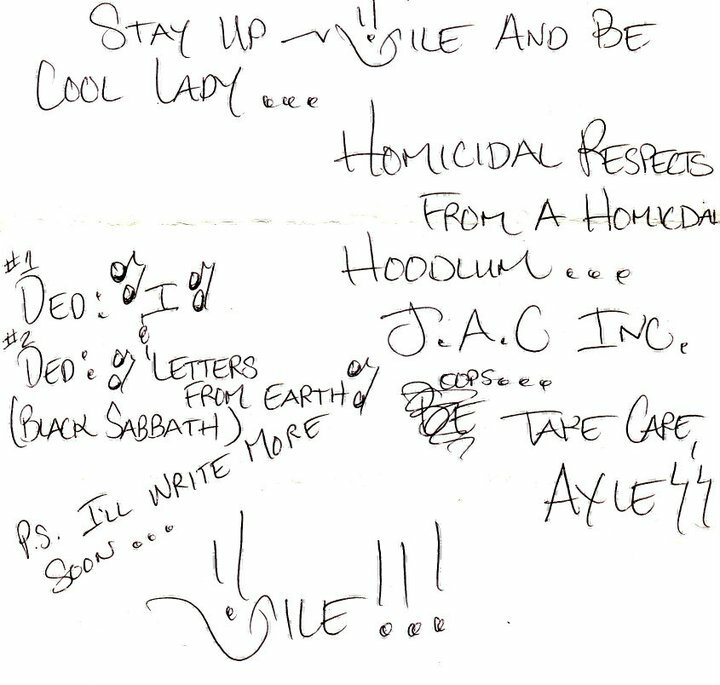 Over the last few weeks in this spring of 2010, as I pulled the crumbling, colored handwritten letters of familiar Bry-guy rambles out of my box of memories, I held them in my hands and it was a familiar feeling. Even ten years later, the smell of the paper and the long sentences dotted with Jiles left me feeling as though I’d just been wrapped in a big bear hug from an old friend. I wondered if he was finally free, and with his daughter or at least near to her. I pictured Bryan and Sean sitting on milk carton stools in front of their mechanic shop, arms crossed like two bulldogs as they watched over their ‘hood. Last week a friend gave to me a number that I could call to check the status of a prisoner in the California Detention system. “Prison ID number?” I provided the number I’d memorized while carefully printing it on a hundred or more envelopes. “Relationship to the inmate?” This surprised me. I hoped they didn’t only release information to family members. Why was he telling this guy? Until a week ago, he hadn’t thought of her in over three decades. Keep lyin’ to yourself, buddy. Tell the old man another lie too. Ray swiveled his head like an owl to see if he was still the only one in the joint. Yep, just him and the barkeep. That’s why you’re telling this guy. There’s nobody else to overhear your pathetic tale of wanderlust. He reached back in his memory. “I gave my little girl a porcelain doll once. Pretty little thing, it was. Soft when you touched her. Dark hair, with green eyes and a smile that was painted on, but like there was a secret inside that couldn’t be seen unless you broke her open.” His daughter had adored that doll. Ray hadn’t wanted to admit to himself why it called to him from the store’s window. It fed his dreams whenever he saw it on her white storybook shelf, propped against the well-read books. The bartender dipped a used glass into a small sink full of soapy water and wiped it dry before placing it among the others. He’d heard this story before, Ray was sure of it. His, or a thousand others just like it. The light peeked in through the dirty windows, casting shadows behind the bottles that glinted beneath the mirror. All lined up, begging for stories. Each shot that was poured was a tale waiting to be told. Ray pulled out his tarnished watch and sprung it open. Three o’clock . He should be on the road right now, logging miles in the rig to get to his next load, but when he’d seen the sign for Apache Falls as he rolled through the Midwest, it lured him from his route. He shoved the watch, a gift from his old man back when he finished school, back into his jeans pocket. He’d seen the sign on many of his trips across the country, and tried like hell to outrun it as he pushed on the gas just a little harder than usual. The memory of one night had haunted him for a lifetime. “Yeah? Always wanted to visit the old South. Take the wife to that there ol’ Opry, see some of the greats.” As if on cue, Merle Haggard came alive on the jukebox that sat in the corner. The volume was low, to match the empty bar. “I’ve been there and back a hundred times or more.” Ray said. “Got a few of those myself.” Joe chuckled. “She’s the only one. A surprise when she came along, but I wouldn’t have changed it for anything.” Ray told the old man how nineteen-year-old Ellie had tearfully given him the news. He stared in horror at the blue-eyed blonde-haired girl before him. The girl next door, literally; they’d grown up together. They’d messed up, and now she was pregnant. They were small-town kids, he only a year older at twenty. Back then a man did one of two things – stepped up or fled the coop, and he wasn’t a runner. Until now. They weren’t in love, but they liked each other enough to get hitched for the sake of the baby. Ray and Ellie grew into each other, and Sarah bonded them. But Ray had a secret. Just as they’d begun seeing each other the year before, he’d put a down payment from money he’d saved working at the local service station on a used long-hauler. He hadn’t been on too many gigs when he rolled through Apache Falls one afternoon as the sun was setting over the prairie. He remembered it like it was still painted fresh in his mind. Reds and oranges and pinks streaked the sky as the blazing yellow sun settled into the distant hills. As he pulled in to stay for the night, there was a roadhouse with an open door where a young crowd stumbled in and out, smoke trailing behind them that clouded around the neon beer lights. Figuring he could use a drink to wind down, Ray parked his truck in the vast field behind the shack alongside two others. It was three Budweisers after he figured out this was a guy who didn’t ask for proof of age when he ordered a shot of Jack with the next round. While he waited on the drinks, a girl about his age slid onto the stool next to him, rubbing shoulders as she leaned with laughter at whatever her girlfriend had said behind her. “Oops! Sorry!” She straightened herself on the chair and giggled at the bartender when he came back. “A champagne cocktail for her,” she nodded to her friend, “and…“ glancing at Ray, “I’ll have what he’s having!” Her green eyes rested on his for a millisecond, but it was enough. Admiring the way her chestnut hair fell in waves just past her shoulders, brushing against the western-styled plaid shirt tied at her waist above the faded jeans covering the longest legs he’d ever seen, Ray forced himself not to stare. “Uh,” he stammered, “It’s on me, whatever she’s having.” He tugged at some wrinkled bills from his pocket, tossing them on the bar. Suddenly there was no crowd, no Journey playing in the background. There was only this creature smiling at him. Coming back to his senses, he shouted his name above the din while her friend snatched her pink cocktail and danced her way back to a group of friends. And there they sat until the bar closed down. They walked outside and around to the back field, neither ready to say goodbye just yet. He learned that she was a rancher’s daughter, some days content with that but there was an artist in her longing to be freed. Ray couldn’t stop himself from reaching into the starry night and caressing her cheek. “There’s nothing silly about that.” And then they kissed. It seemed to last for hours, and he knew he wanted it to last a lifetime. The more they shared, the further in love they fell. When the sun began its ascent, Ray and Anne couldn’t pull themselves apart without a sadness overtaking them. But he had a job to do. “It’ll only take me two days to reach the west coast, and another two to get back after a quick stop at home.” Ray held her chin up high so he could hold her gaze steady with his. “But I’m coming back for you. If you’ll have me.” It was a promise he wanted to carve in stone. “I think I want that… very much…” she raised her lips to his again as they curved into a smile. And they parted. Two days later, his promise was lost in that prairie when Ellie shattered his world. How the hell…? They’d only been together three times. Hell, they’d only been dating for just a few months. The mornin’ after blues from my head down to my shoes… words echoing through him like a witch’s chant. Ray never could bring himself to go back to that little town. Surely she was better off thinking it was a magical night that never really happened, rather than being with a man who ran off and left a baby behind. It was a secret he harbored from Ellie for the last eighteen years. They’d settled into a life that was content, she went to work running the office of a local attorney, and the road trips gave him the quiet he needed; but Ray knew his heart wasn’t in the marriage and knew that hers wasn’t either. One day they’d gone to a museum in nearby Ashland, a last family outing before the summer ended and Sarah was off to school. There was a collection premiering of Midwestern artists. His heart nearly seized when his eyes fell on a canvas featuring an old ramshackle roadhouse, dimly lit on a starry night, with two lone figures beneath the moon. The placquard next to the art read Anne Turner. It was then that he made up his mind. His little girl was going to be on her own now. It was time, and Ellie deserved better than what she had. They’d made a good life for their daughter, but it was time. After dinner that night, Ray sat his wife down on the front porch swing, and they talked. They were good enough friends that the tears were brief, but this wasn’t an unexpected twist for either of them. But now what the hell do I do? Quietly that weekend he stuffed his clothes into oversized duffle bags. “Don’t worry.” Ellie watched him with a forlorn, faraway expression, a prideful grace keeping her still. “Your stuff’s not going anywhere. You can come get it when you figure things out.” He loved her then, more than he ever had. And now here he was in Apache Falls, telling his story to a stranger while he nursed the broken heart he didn’t deserve to have. “The thing that I called living was just being satisfied, knowing I had no one left to blame.” The two men were silent for a moment. Joe reached beneath the payphone that hung on the wall like a lonely reminder of simpler times and grabbed at the thin phonebook, tossing it on the bar in front of Ray. Ray stared heavily at the mirror again, still trying to recognize the man he saw. Slowly he opened the dusty book, turning the thin pages until his finger rested on her name. Reaching for his cell phone, Ray realized he’d left it in the cabin of the truck. Joe bounced a couple of quarters at him, and as if in a trance he watched them roll to a stop and fall down on the bar top. Ray pushed himself to his feet, still unsure. He could walk out of here right now, and nobody else would ever know he’d been here. Indecision hung in the air, shadowed with fear. Finally he moved toward the phone. Joe walked off to the other end of the room, pretending to dust off the pool cues in their rack. Searching through the fragments of my dream-shattered sleep, I wonder if the years have closed her mind? Dropping the coins in the slot and lifting the receiver that smelled of many drunken pleadings for forgiveness, Ray pushed the buttons with trembling fingers.